Over the years my collection of cycle books has grown and I’ve gradually been drawn into the secret lives in innumerable passionate cyclists. So what are my top reads? 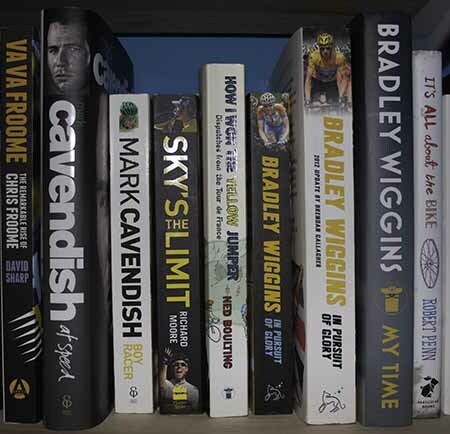 The logical place to start would be where most reader first come into touch with cycling books, Armstrong’s Not About The Bike fable… but let’s start somewhere else, with a true (albeit flawed) cycling genius. The autobiography of Marco Pantani is a fascinating book that tracks his rise through the ranks, and captures his demise in an honest but understanding manner. Maybe it’s because Pantini was one of the last ‘individual’ stars before cycling became an industry off the back of the Armstrong approach, but this book is a real eye opener. It’s definitely worth coming right up to date and reading the Sky book. It’s one of two books that I think should be mandatory reading for anyone with any leadership responsibility. It’s a fascinating book that seems to show that overpowering ego-centric despots are not the key to team success. By way of contrast, the story behind the Linda Mcartney vegetarian team is fascinating and I suspect that there are professional teams that run in a similar manner today – bearing in min. Throughout the book the team lurch from one financial crisis to another and manage to keep their heads above water for a while – but it must have been desperately frustrating being part of that team, and any other privately backed team. While we’re talking about books, can I please encourage you to avoid Amazon. I believe that the way that businesses like Amazon, Google and Vodafone run their tax affairs skews the prices they offer to consumer in their favour and creates an unfair playing field. There’s more about my Amazon views here, and where best (in my opinion) to buy books.